For the last two invitations, awarded to Direct Energie and Arkéa-Samsic, several other teams were expecting to receive one and most importantly Vital Concept-B&B Hôtels which thus is out of competition for the 2nd year of its existence. Other teams, like for example Delko Marseille Provence, probaby haven't even been considered because the choice was already quite difficult between the two teams which got invited yesterday and Vital Concept-B&B Hôtels. 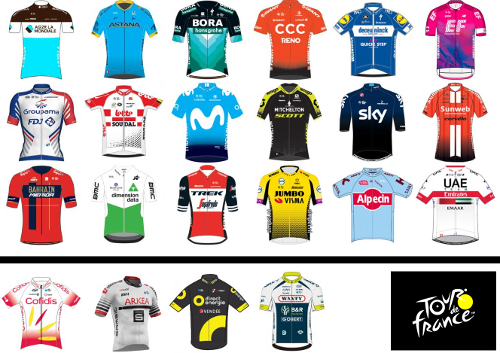 In the end, names like Lilian Calmejane (stage winner in 2017), Adrien Petit and Niki Terpstra (7 participations in the Tour) for Direct Energie or Warren Barguil (KOM winner and two times stage winner in the Tour de France 2017) and André Greipel for Arkéa-Samsic apparently sounded better than those of Bryan Coquard (who has never had his chance to win a stage in his 3 participations between 2014 and 2016), Pierre Rolland (winner of two stages, in 2011 and 2012, and best young rider in 2011) and Arthur Vichot for Vital Concept-B&B Hôtels. "This announcement is very difficult for the whole club, staff, riders and fans. Our fifty employees and our sponsors do not understand that we can not participate in this major event of the international calendar. After our first season and since the start of 2019, we have proved being able to participate in the Tour de France and to animate it. This winter, we have listened to the comments and requests formulated by ASO and we have set up an all-terrain team based on this feedback, getting in new offensive and experimented riders who are capable to perform in the mountains. Despite that, it seems that's not enough. It's difficult to understand but it's up to us to show that the decision taken by the organisor of the Tour is not the right one. We'll continue to perform in order to get the results which will allow us to get in the picture for furture decisions and seasons. This "non-invitation" is of course some sort of a show stopper for our project but all its members and sponsors keep the faith. We have long term ambitions and the club has a future, with or without participation in the Tour de France 2019. There's a challenge to relieve and our sponsors, who are as disappointed as I am today, take note of this decision, and are conscient that we'll have to make even more efforts. Let's continue to go ahead in our direction, an innovative and ambitious one. Only by continuing our hard work we will be rewarded." As a compensation effort, the Vital Concept-B&B Hôtels teams has again been invited this year to participate in the Critérium du Dauphiné, next to the 18 UCI WorldTeams and Cofidis, solutions crédits ; Team Arkéa-Samsic and Wanty-Groupe Gobert. Want to know more about the Tour de France 2019? ... and soon you'll find all news about the sponsors of the Tour de France 2019 (and yes, there is quite some news about that) and of course also the complete race route on Google Maps / Open Street Maps / Google Earth (as soon as possible, but that'll only be in June .. due to the late publication of the necessary data by the organisor)!